DARCY George is no ordinary nine-year-old. 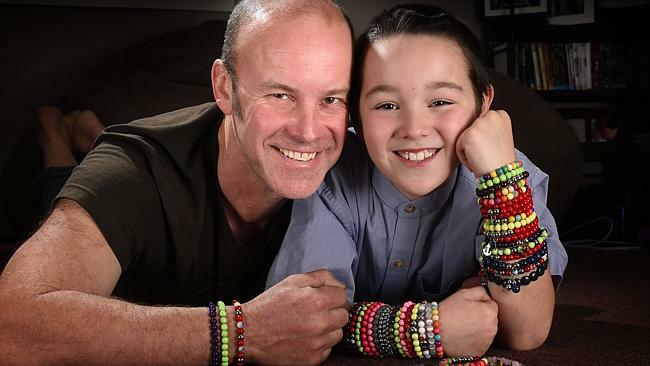 While his mates may pass their evenings playing video games, he spends hours making multicoloured bracelets to sell at school and the local cafe. It’s an idea he came up with while selling old toys at the market with his mum — a way to raise money for multiple sclerosis after his father Steven was diagnosed. “It feels good that I can raise some money,” said the Mount Waverley boy, nominated for a Pride of Australia Child of Courage award. “Kids at school ask me what multiple sclerosis is and I tell them it attacks the spine. In just six weeks, Darcy raised $3000 for the cause with the help of his mum Sheri. He spoke to the student council at Wesley College and they’re planning a roller skating fundraiser, to be held on the second last day of term. The grade 3 student said while he hopes to raise another $1000 to help others like his dad, he also hopes to teach his friends about the disease without a cure. “Because then more people will know more about it, and just in case it happens to someone they know,” Darcy said.